What if creaks the door? Creaky door – the phenomenon is extremely unpleasant. 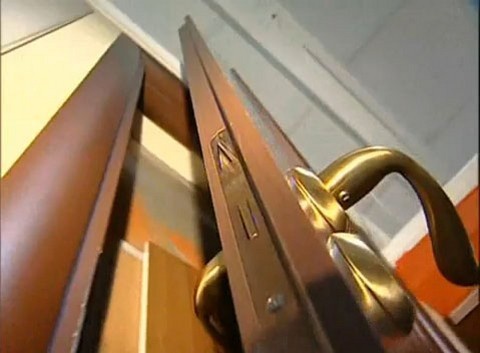 What to do if you suddenly found that your interior doors or entrance doors irritate the nervous system hideous creak? Here are some tips that will help to solve this problem. So, if you have a squeaky door hinge than to lubricate? Engine oil is the most reliable and proven way to get rid of the creaking doors. You can use diesel oil or special oil that lubricates the parts of a sewing machine. Also suitable tools such as tsiatim, grease, Litol, and other greases. You can still do the following: buy a medium in which to handle any arrangements apart from the doors. They are sold as sprays – spray on problem areas and nasty squeaking will disappear. If I suddenly found that the door creaks, and no special equipment is not at hand, use vegetable oil. But the effect of such a lubricant can be very short-lived. Most likely, after a few days the door will again begin to creak. So you can use an alternative method, the lubricant may be graphite shavings from the conventional pencil. Spray WD is another good tool. It can be purchased at an auto parts store and use for lubrication of the doors and the restoration of other mechanisms. The sound of a creaking door can become a source of annoyance to any person, but before you begin to deal with the problem, you first need to figure out where the squeak is. Unpleasant sounds can publish any part of the loop – both external, and internal. And if you're splashing a variety of means all places in a row, not knowing where the root of the problem, it is likely that to get rid of the squeak the first time will not work.